I Quit. I give up. I. Am. Done. You know those days, its cloudy, the weather is cooler, its damp, I am rummaging around for sweaters to wear, I am eating waaaay too many carbohydrates for comfort food and its all going terribly wrong. Facebook shows me that all my friends are married to perfect spouses, their children are all excelling and they’ve launched their own business and overnight Julia Roberts is wearing their creations and they all tell us they have a ‘SIX FIGURE INCOME’. Meanwhile on my island, people are starting small businesses from ideas they saw on Pinterest. They can’t keep up with demand and they just started. They’re hiring videographers to make their films, top graphic artists to do their websites and oh goodness me, they’ve got 18 million Instagram followers already. So today I stomped around my office like a petulant 3 year old and kept saying ‘I am done, this is too hard, life is too difficult". And I add “AND I AM QUITTING THIS STUPID 30 DAY BLOGGING, I DON’T HAVE TIME”!!!. The other Bloom came over to see what the ruckus was about and quietly sat while I ranted and raved and then she got up and just hugged me. I tried to explain but she went and made me tea. And an individual oatmeal cake that she specializes in. And it helped. I picked myself up off my pity party platform and thought “let’s try this again”. It helped that I did NOT go on Facebook and look at all the other popular kids making 6 figure incomes, I checked my messages only and turned it off. 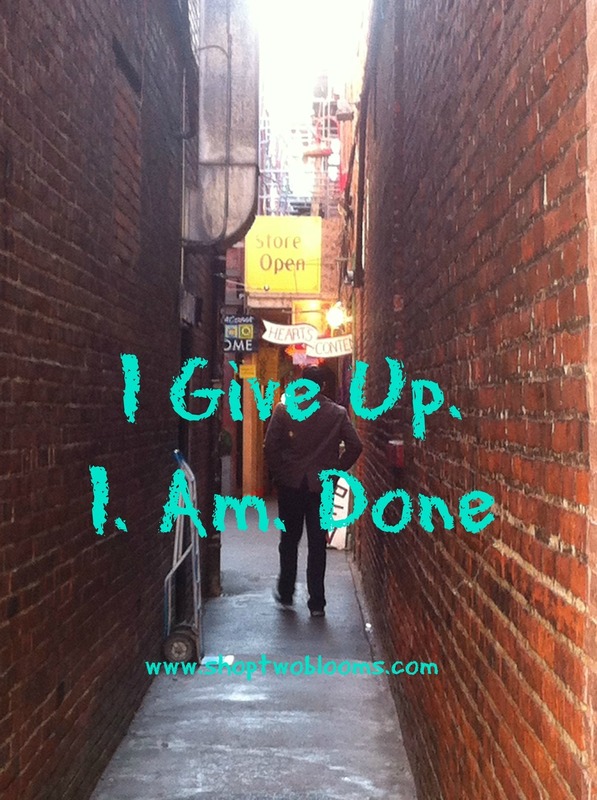 And then I sat down and wrote this blog and realized I had to keep going. You put one foot in front of the other and you just keep going. You find a warm sweater, a nice cup of tea and you start again. And the best part, try and find someone who will give you a hug or even feed you cake. Caron is one of the blooms of Two Blooms Design Studio Est. 2002. She is the dreamer, production manager and the social media wannabe. Caron is married to the word adventure and she will never stop dreaming.